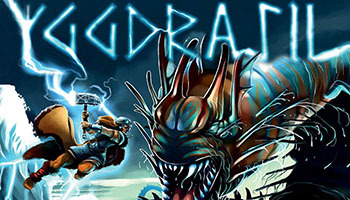 Yggdrasil is a co-operative game in which players are different gods of the Norse mythology: Odin, Thor, Tyr, Frey, Heimdall and Freyja. Monsters, the wolf Fenrir, the huge serpent Jormungand, the Fire Giant Surt, the Goddess of the Dead Hel, the traitor Loki and the cosmic dragon Nidhogg are moving forward in Asgard inescapably and announce the impending coming of chaos and destruction on the world tree Yggdrasil. Together the players have to resist to the impending coming of the Evil forces in Asgard, the gods' world. Each player, depending on the god he plays, has a specific power that allows him to perform some actions better. All of these actions have to be used in the right moment or the victory will be unreachable. The players will need cleverness, calm and team spirit to challenge the game. Yggdrasil, the "terrible steed", a cosmic ash tree that supports the nine worlds, is in jeopardy. As the Ragnarok approaches, you, mighty among the Aesir and Vanir Gods, have to face the relentless advance of Evil Forces. You must sacrifice everything to prevent Evil from destroying Yggdrasil. The last battle, predicted since the dawn of time, is starting now. Your only aim is to repel the Evil Forces in order for Yggdrasil to survive this universe at war. In Asgard, the Gods fight the Enemies and try to make them move backward. That is the main plot of the game. The Enemies' combat force varies according to the area where they are located. Choose your opponent among the six Enemies or the Giants. Place a number of Vikings of your choice from your own stock (it is possible to place no Viking at all) on the World of the Dead . At the beginning of each turn, when a player takes an Enemy card from the stack, he moves the corresponding counter forward to the next space (on the right). The effect of the Enemy is applied. His power is determined by the area that he has just arrived in. It should be noted that the last space (Odin's residence) does not trigger the Enemy's effect but can lead to the Gods' defeat. King of the Gods, you are a warrior, For you, heroes die with honor. To become cunning and wise, To Mimir, you gave one of your eyes. Takes two Enemy cards from the stack instead of one, chooses which one he wants to play and puts the other one back on or under the deck. Son of Odin, your strength is colossal But you are also agile. Against you, giants are warned, You protect the people of Midgard.